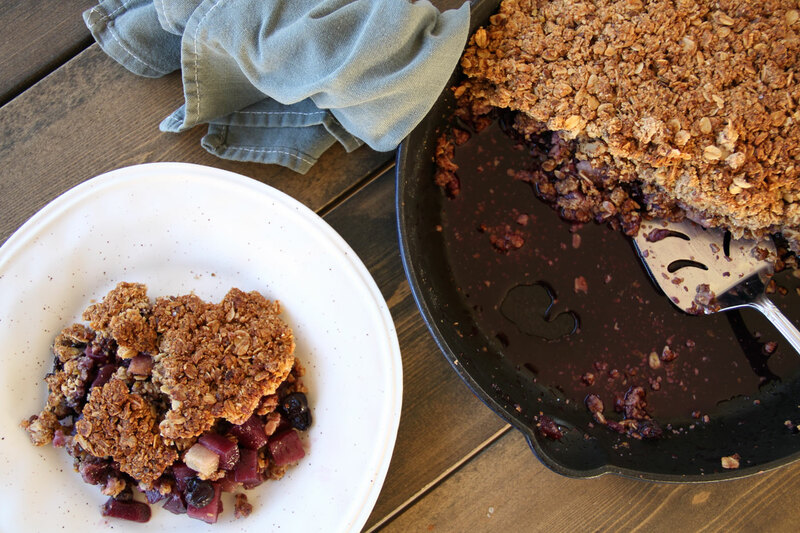 Easy and healthy, this Pear & Berry Crumble was inspired by a recent issue of Impact Magazine. The headline of the article read ” Beauty From Within” it was part of a series of skin-detoxifying recipes. I was instantly sold. One thing we always encourage our clients and readers to take into consideration when it comes to food is to ask themselves “what will this food do for me?” in other words, will this food benefit you in any way or will it cause more harm? Now consider a time when you ate something vibrant, nourishing and healthy that you felt good about (like a large green salad with organic veggies and home-made dressing), how did you feel after that? Food is medicine and when we want to obtain good health, energy, and vibrancy we need to eat the right way. Here at Active Vegetarian, we strive to create wholesome plant-powered recipes that bestow an abundance of nutrients to help you achieve great health and also leave you satisfied. This Pear & Berry Crumble is gluten-free, naturally sweetened, with a twist of fresh ginger, cardamom and lemon. 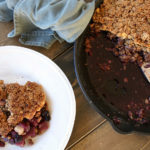 Gluten free and naturally sweetened with pure maple syrup, this healthy pear & berry crumble is super easy to make and will be ready in about 1 hour (prep + bake time). Preheat oven to 350* F (180*C). In a large bowl combine oat flour, oats, ground flaxseed, salt, cinnamon, cardamom, ginger, lemon, coconut oil, and maple syrup until fully combined and has a crumble like texture that sticks together. Set aside. If you are using frozen blueberries, place them in a bowl with cold water. Continue to drain and soak them using cold water. If you are using fresh berries, soak them in a bowl with water and a touch of salt or apple cider vinegar. Meanwhile, wash the pears thoroughly and chop them into small bite-size pieces. Coat a cast iron baking pan with coconut oil. Combine the pears and drained blueberries and spread into the baking pan. Top the fruit mixture with the crumble and lightly pack it down using a spatula or your hands. Bake for 40-50 minutes or until lightly browned. Optional to use other fruits or berries. Have fun - and experiment. 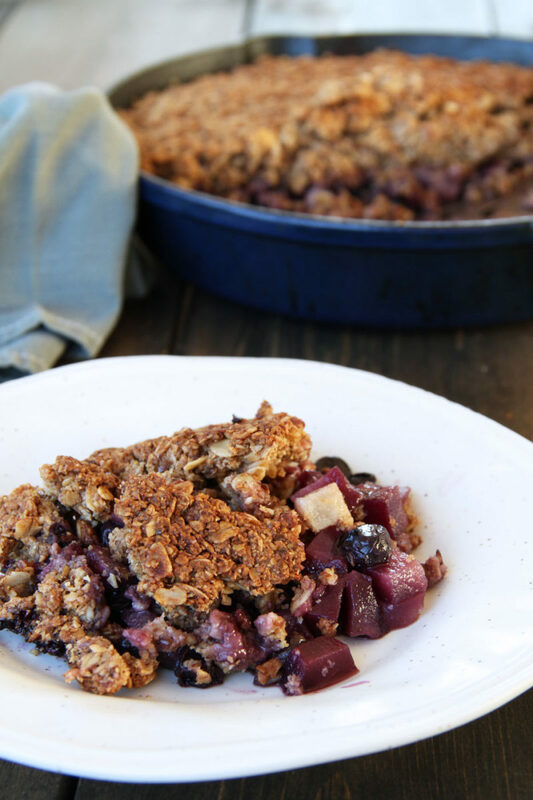 This Crumble is perfect for Meal Prep, Sunday brunch or a quick healthy holiday dessert. It also partners well with some homemade banana “ice-cream”, “raw coconut yogurt”, or “raw almond coconut yogurt”. If you try this recipe or create something new from it – let us know! Leave a comment, take a photo and don’t forget to tag your yogurt creations #activevegetarian on Instagram so we can see.